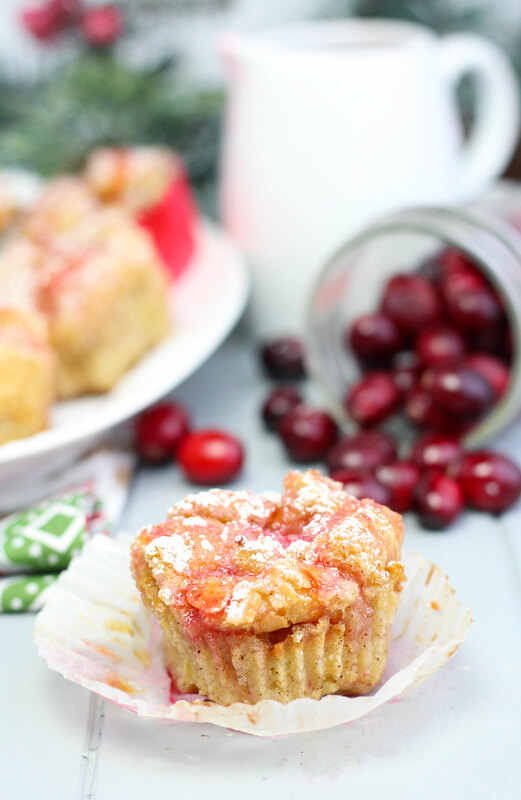 These Eggnog French Toast Cups with Cranberry Syrup are perfect for Christmas brunch. 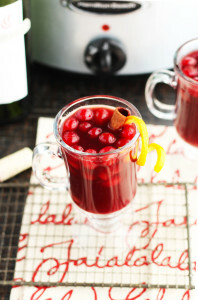 The flavors of cinnamon and nutmeg taste so ambrosial with the fresh, cranberry syrup. 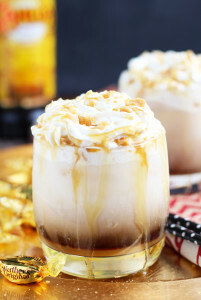 Add a sprinkle of powdered sugar and an extra bit of syrup before serving for a decadent treat that will have you hearing sleigh bells. 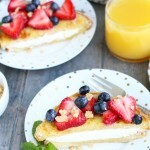 I love the idea of individualized servings of French Toast. There is no guessing how big to cut it and assurance that there will be enough for each guest to savor. More importantly, they look super cute and taste amazing! Let’s talk about THAT SYRUP for a second. 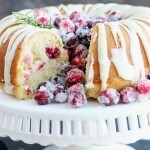 Nothing screams Christmas morning like the flavors of Egg Nog and fresh cranberry syrup. 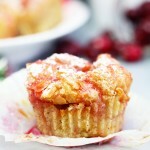 It is SO easy to make by gently boiling fresh cranberries with sugar and a bit of orange juice. Once thickened, the syrup is easily strained to remove any chunks. Hmmm…I don’t think I should ever use the word chunk while discussing food again. That is just too hard-hitting this time of the year. 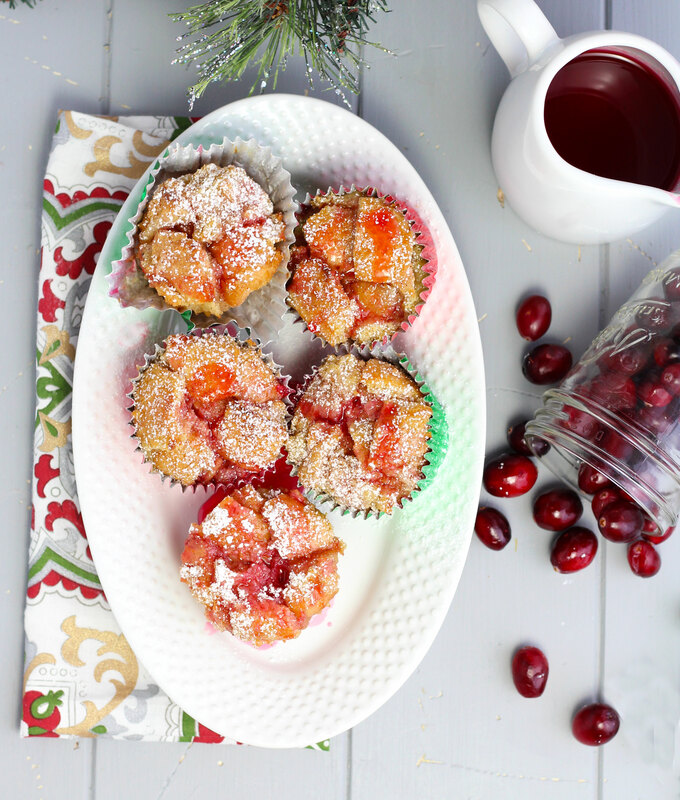 Choose festive muffin cup liners to amp up the Christmas cheer factor. I sent my husband to the store to buy said festive muffin liners and ended up with red and green metallic. Which would be fine for entertaining, but not the best for photographing due to wild reflective surfaces! Sending him to the store is definitely rolling the dice, but at least it keeps me out of this nasty cold weather. I sear it was like 60 degrees only a couple of weeks ago! No wonder its a chronic snot factory around here. My daughter seems to use my shirt as a tissue to motor boat at any given time. Usually, when I’m trying to leave the house for work. Try to stay warm out there! I recommend hot drinks with alcohol and an adult onesie. I wonder if my husband would find that attractive? 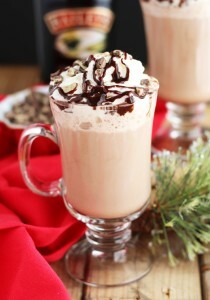 Until then, this Baileys Peppermint Hot Chocolate will have to do! 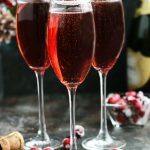 Check out my Saturated Saturday Page for more cocktails seen below. 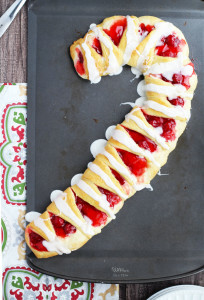 A Candy Cane Crescent Roll Pastry will also make a great addition to your holiday brunch menu! 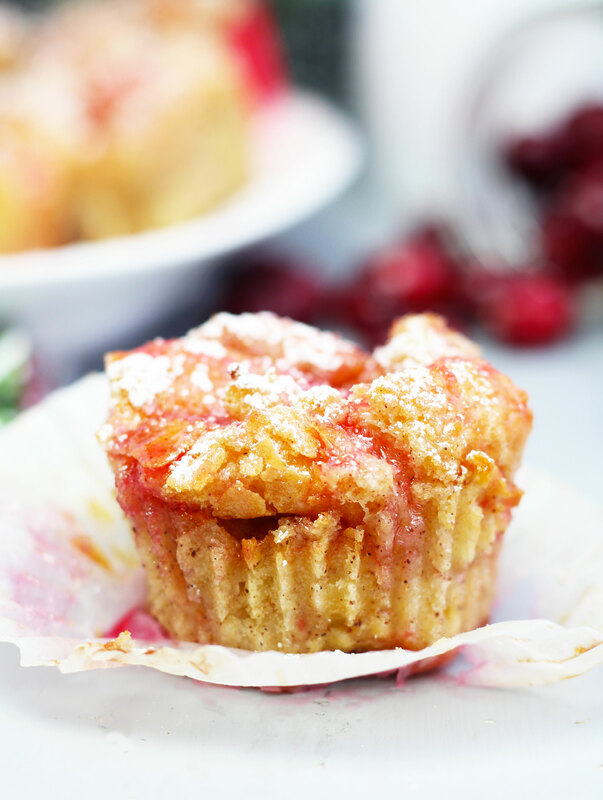 Egg Nog and fresh cranberry syrup make these French Toast Cups perfect for Christmas brunch! Add bread cubes to a single layer on a cookie sheet. Bake them at 220 degrees for around 5 minutes until slightly dried. Add cranberries, orange juice and sugar to a small saucepan on medium heat. Bring to a low boil and cook until cranberries burst and sauce thickens for around 3 minutes; stirring continuously. 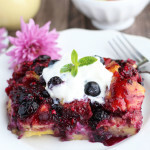 Allow mixture to cool and begin preparing French Toast. 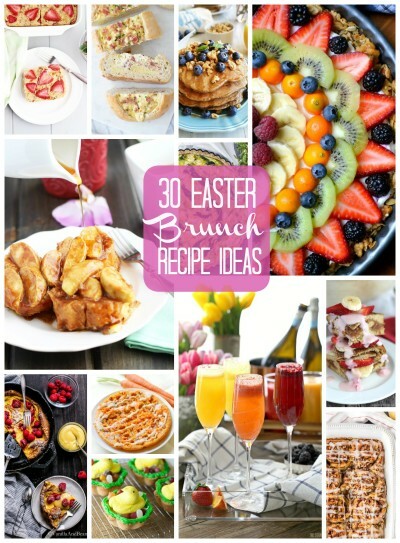 In a large mixing bowl; whisk together eggs and sugar. 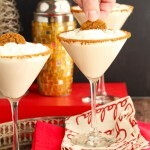 Whisk in Egg nog, milk, melted butter, nutmeg, cinnamon, vanilla and rum extract. Add bread cubes to mixture and lightly stir until coated. Allow to set for several minutes. Add muffin cup liners to a 12 count muffin tin. Lightly spray liners with cooking spray. 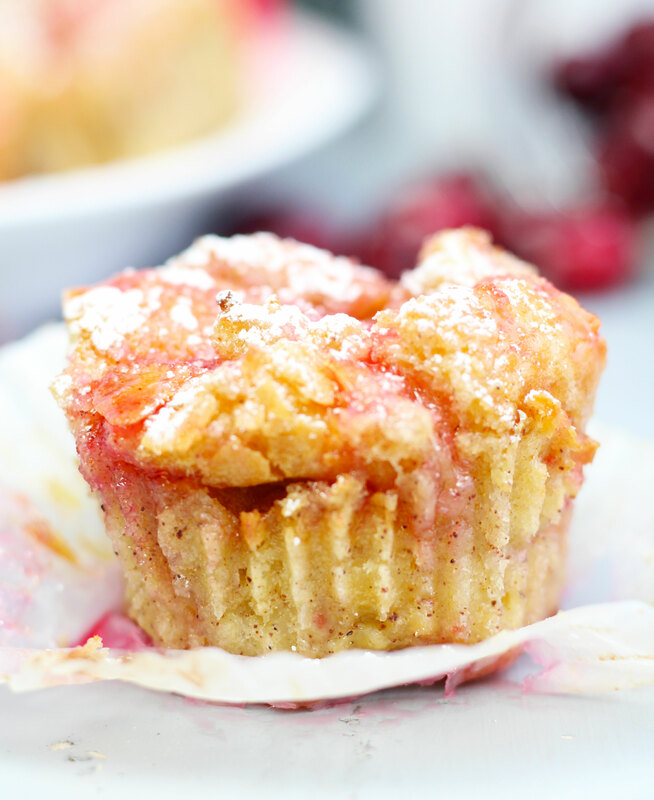 Fill liners halfway with bread mixture, drizzle with cranberry syrup, fill up remainder of muffin cup until full to the top, and drizzle with more cranberry syrup. Bake for around 25 minutes until set and lightly golden brown.